We hope that you will find it helpful, and will share it with your colleagues and friends. At the end of the day, all practitioners understand it isn’t risks that are important, but the extra work needed to conform to the FSC requirements. In this case, we are talking about required mitigation steps for areas of “specified risk”. FSC calls these mitigation actions “Control Measures (CMs)”. It’s worth emphasizing that CM’s won’t apply to everyone. They largely exempt the Northeast, Lake States, and Southwest regions (Where?). In the rest of the country (the West, Southeast, and Appalachians) it might be possible for some companies to limit their involvement. But we think most will not, and that CM’s will apply broadly across these regions. FSC-US have taken an innovative and progressive approach to the Control Measures proposed in the US-NRA draft. The CMs emphasize collective, community actions rather than actions taken by individual companies. This is a welcome change from FSC’s typical prescriptive style. We fear, however, that the details may prove rather challenging. Unlike other FSC standards, the actual language includes a curious mixture of requirements for FSC-US and certified companies. Distribute “educational information” to your suppliers. The material will be provided by FSC-US, but hasn’t been produced yet, but will include mandatory (& rather silly) “statements” about unacceptable materials. 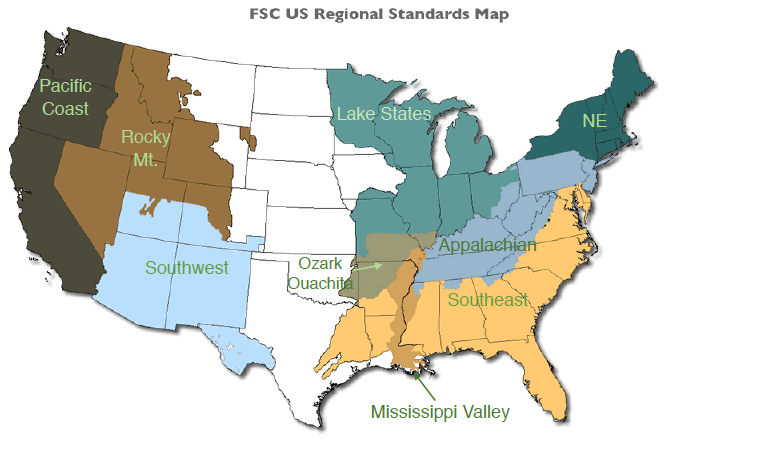 Attend (or follow) Regional Meetings that will be hosted by FSC-US. Attendance is encouaraged, but not required. The meetings are planned to include ‘learning sessions’, ‘information sharing’, and ‘collaborative dialogues’ to identify a ‘focused set of actions’. Implement one or more of the ‘focused set of actions’. What will this include? Nobody knows. We summarized the proposed Control Measures (CMs) in the MixedWood User’s Guide. The last 2 page lays them out using a Where & What? format. You can download it separately here. Who produces, edits, and approves the ‘educational information’. Can a company substitute their own version? If so, who approves it, & against what criteria? Will FSC-US staff control content? If not, who? What happens before the 1st Regional Meeting? Will each company have to invent their own actions? Who sets agenda and schedule for Regional Meetings? How do Regional Meetings governed and reach decisions? Consensus, majority rule, etc.? Can stakeholders vote by proxy? Do FSC members have greater weight than non-members? Who decides if objectives are met? If the Regional Meeting fails to reach acceptable conclusions, does the Contingency Plan (outlined in separate document) become normative? When will implementation become mandatory? Will actions be one-time or recurring? Will companies pick from a menu of choices? We see a lot of good ideas in the innovative and progressive approach that FSC-US has taken to Control Measures in the US-NRA. The problem is that the work is still unfinished. After 5 years of struggling to find consensus, we are being asked to approve a program which says that we will solve all our difficult problems in a “collaborative dialogue” later this year. It is very important that FSC-US staff get feedback from the people who bear the burden of putting this project into action. The US-NRA webpage includes a Comment Form with a series of response questions. Not sure what to say? Take a look at MixedWood’s response. Feel free to copy, share, adapt, disagree, or borrow as you like. Remember the old saying: “The world is run by those who show up”. Let’s make sure we show up.